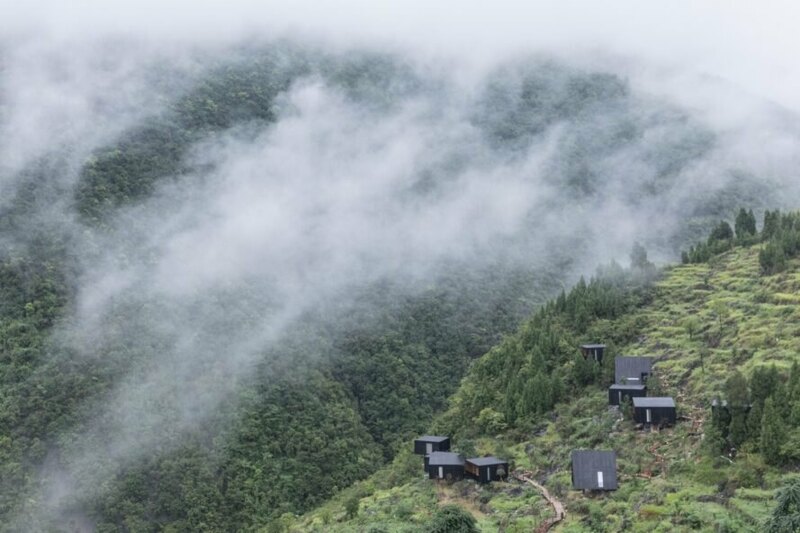 In China’s southwest province of Guizhou, Shanghai-based architectural practice ZJJZ has completed the Woodhouse Hotel, a government-backed agricultural tourism project that consists of 10 single-story timber cabins embedded into the hillside in the remote village of Tuanjie. 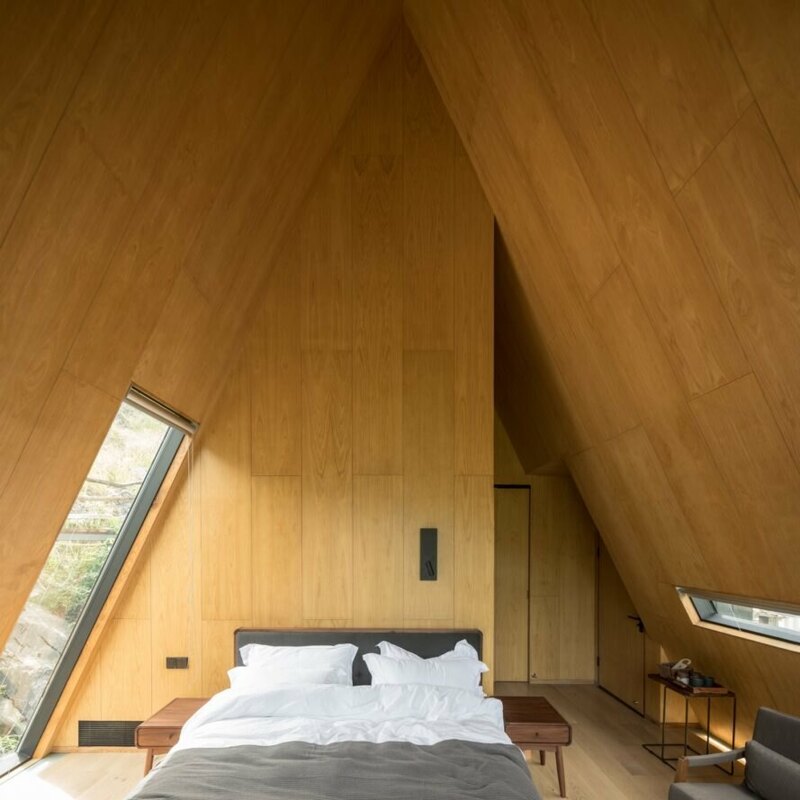 As one of the first projects carried out under the government’s policy to help alleviate rural poverty through environmentally sensitive tourism, the Woodhouse Hotel was designed and constructed with as little site impact as possible. Because the village of Tuanjie had little traditional architecture to draw inspiration from, the architects took cues from the surrounding landscape instead. 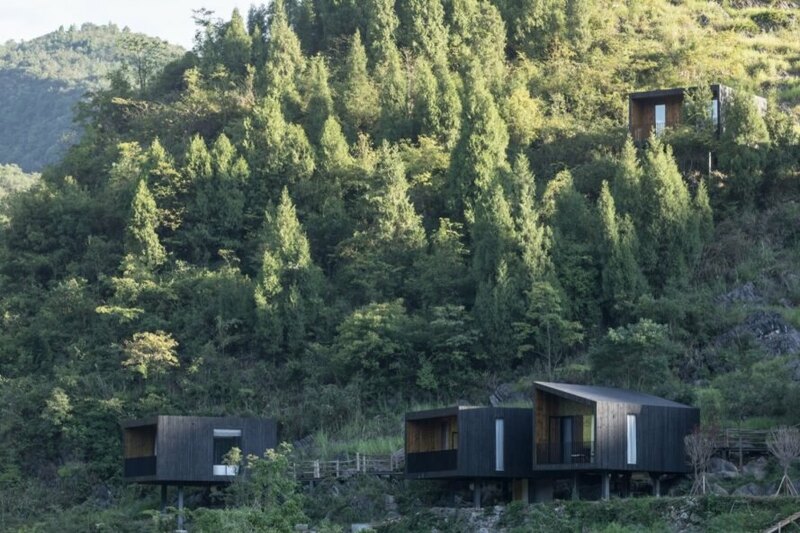 Free from pollution and blessed with striking views, the village’s surroundings prompted the architects to divide the hotel up into a series of simple timber volumes so as to minimize the development’s visual presence. 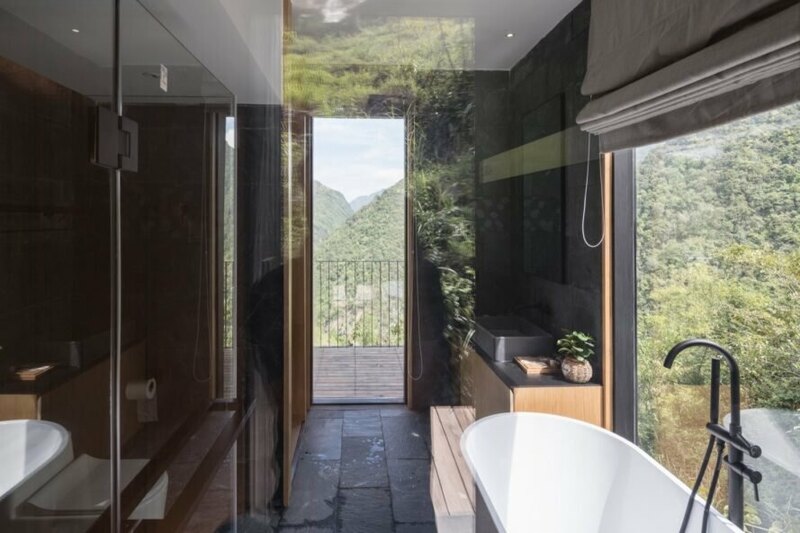 Each cabin, clad in charred timber, was carefully placed on the rocky terrain to minimize site damage and to capture the best views. Given the complex terrain and desire to minimize damage to the original rock formations, site surveys were carried out to map the optimal locations for the buildings while all construction materials were manually transported up the mountain. The architects applied a combined structural system for each cabin, built with a wooden frame atop an elevated steel platform. The timber facade was charred on-site to reduce costs. 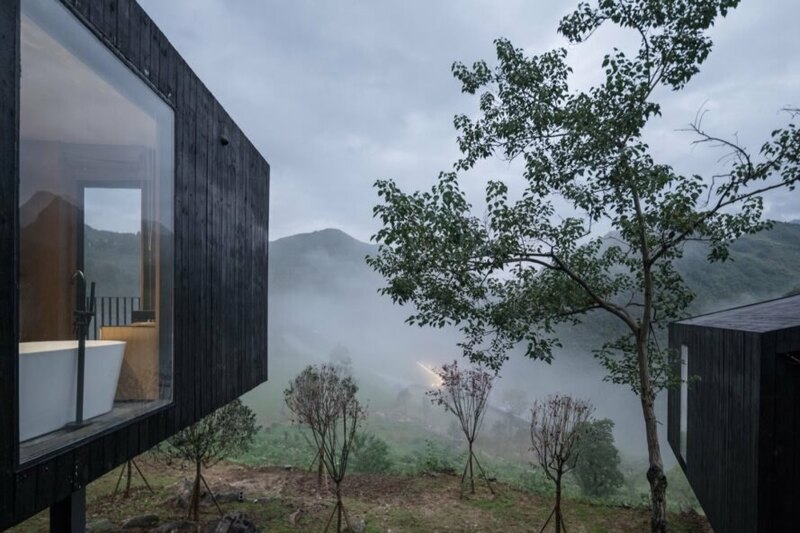 ZJJZ designed this series of black cabins to promote agricultural tourism in Guizhou. 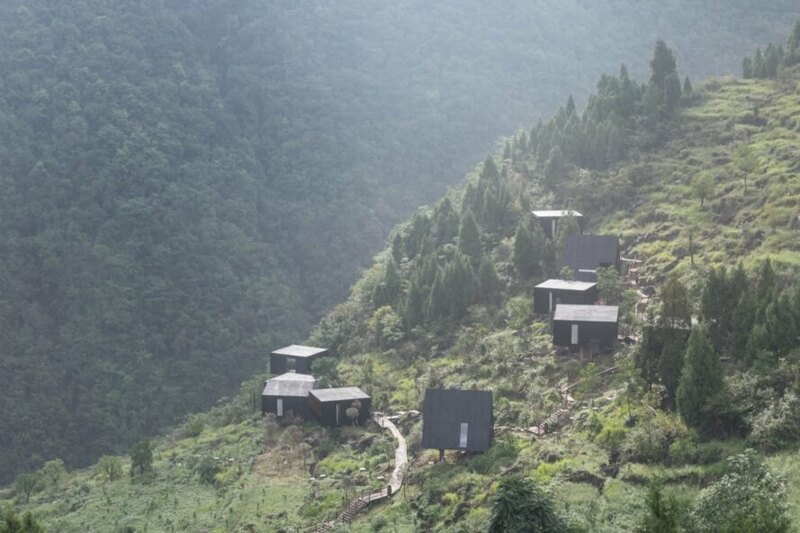 The cabins sit on a rocky mountainside in a remote village. Each cabin is slightly different to follow the terrain. Neutral interiors focus guests' attention on the outdoors. Each cabin is designed for picture-perfect views. The mountainous vistas can be enjoyed from every corner of the cabins. The hotel is meant to blend into its surroundings. Minimal site damage was at the forefront of the design. To further preserve the land, construction materials were manually brought up to the hotel site. Charred facades create a durable exterior that complements the surroundings. Now, the hotel sits as a beautiful addition to the landscape.